The Station, formally known as The Central Hotel was identified as a Critical project by the THI having been selected as being amongst some of the most detrimental buildings to the Conservation Area. Their repair and return to beneficial use are considered to being instrumental in bringing about a change in attitude and perception of the town. The condition of the property had declined over the years as the Brewery had struggled to secure a long term tenant. Sporadic management eventually saw the pub close in August 2013. The reputation of the venue over the years had been associated with public offenses with the police being called on a number of occasions. The main concern with the extensive programme required was to prevent the final use of the refurbished premises reverting back to its previous use and reputation. The THI partnered with Enterprise Inns who began the search to provide the building with a secure tenant whilst the project plans were worked on. The building is a “Gothic Revival” style public house located in a prominent position in central Colwyn Bay at the junction of Station Road, Conway Road and Abergele Road. It is thought that the original c.1870 building was to the designs of notable Chester based Victorian architect John Douglas and was originally named the Station Hotel. 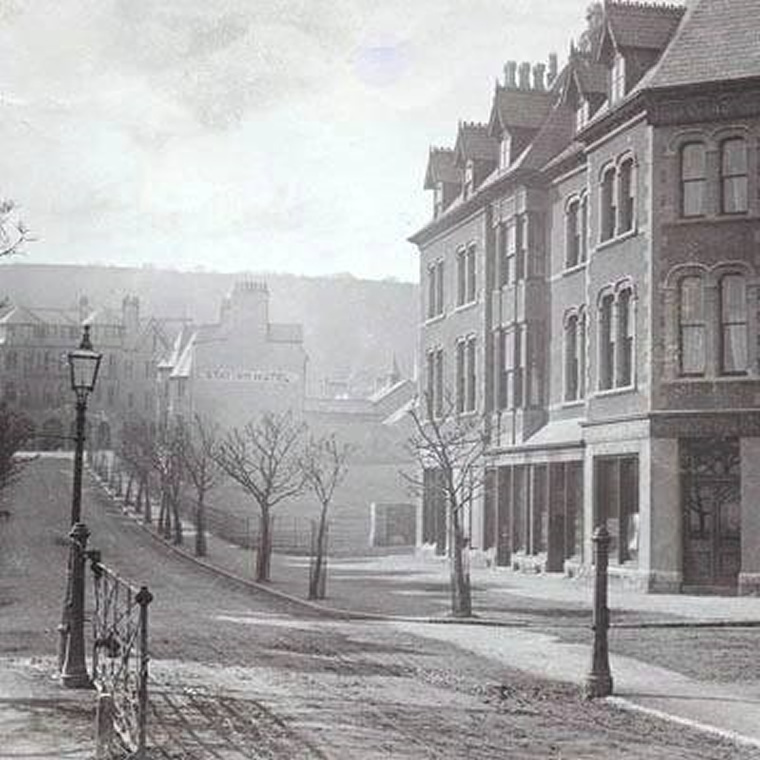 The Station Hotel was one of the earliest buildings in the town and features on the 1879/1880 Ordnance Survey map when Colwyn Bay was just a hamlet. Triggered by the sale of the Pwllycrochan Estate in 1865 and subsequent establishment of the Colwyn Bay and Pwllycrochan Estate Company in 1875, building plots were sold off with their uses controlled by the Company, who aimed to develop a fashionable resort with easy rail access from North West England. According to the 1879 map, Station Road was partially developed on its eastern side and the only building on its west was the Station Hotel. Originally, the Station Hotel consisted of a bar, shop and numerous smoke rooms with living/hotel accommodation above, cellars and kitchens below and stables to the rear. The building was built from local carboniferous limestone in a polygonal walling style with a natural Welsh slate covered pitched roof with a mixture of hips and gables, timber sash windows and doors, cast iron rainwater goods and wrought iron railings to the front. It had multiple entrances to both Station Road and Conway Road, serving different parts of the business. The overall aim of the scheme was to refurbish and upgrade the premises to a standard that would see an upgraded premises and to ensure the sustainability of such an upgrade. It was also intended to provide a model for other development projects and act as a catalyst for the wider regeneration of the town. The project involved renewal of the ground floor public house frontage refurbishment, reinstatement of two demolished chimney stacks and full external repairs. Internal changes to the layout of the bar area, installation of new kitchen and toilet facilities and refurbishment of the first floor function room. A key element of the proposed rebranding of the public house is to re-introduce the offer for daytime/evening meals to a suitably high standard. Repair the structure and conserve the surviving external historic architectural features such as sash windows, external stonework, slate roof and cast iron rain water goods. Repair the surviving internal historic architectural features such as internal joinery, staircase and original glass windows. Refurbish the ground floor to provide an open plan restaurant and bar area with new kitchen and toilet facilities. Refurbish first floor management accommodation to encourage permanent tenants. Refurbish first floor function room to facilitate functions and provide a venue for the local community. Refurbish to a high standard whilst ensuring the repair and preservation of existing historical features. Refurbishment of first floor accommodation and function room to encourage improved standards. Installation of new shop front to reflect a previous facade using evidence from historic plans and photographs. External repairs to the building included stone masonry repairs and replacement to front elevations. Brick masonry repairs and replacements to rear elevations. Re-pointing of existing stone elevations. Replacement of chimney stacks using photographic evidence. Overhaul and refurbishment of all existing traditional timber sash windows and new cast iron rain water goods. Various options/styles were considered for the project taking precedent from previous historic design styles, traditional and contemporary detailing. The initial proposals explored design styles and proportions taken from the 1905 frontage primarily made up of large fixed panes with “split” top hung casements above. This design was deemed by the design team to appear too “domestic” and needed to be more contemporary incorporating traditional detailing. The final design was a hybrid of initial proposals, incorporating the recessed entrances reminiscent of the 1905 frontage and keeping a continuous unbroken horizontal fascia resulting in a traditional yet contemporary aesthetic. The new design for the building was driven by the need to provide a financially viable new use. The ground floor of the pub was previously divided to form a separate lounge and bar area. The brief was to create a more open and welcoming space by removing the modern stud wall between the bar and the lounge to form one large space around a centralised serving area. The internal non original finishes were stripped away to reveal original detailing and decorated in a more modern contemporary style to form a more harmonious family-orientated interior. THE STATION-Tape Export 01 (720HD) from Tape Community Music and Film on Vimeo. Client/ Developer:Enterprise Inns, Colwyn Bay Townscape Heritage Initiative, Conwy County Borough Council, The Baylife Project Board which consisted of the funding bodies, including representatives from the Welsh Government, Cadw. The Project Team formed by the internal support group of Conwy County Council. Funding body:Heritage Lottery Fund (THI): A grant system designed to help communities to regenerate parts of their towns and cities. The size of the grant is dependent on the work to be undertaken.